2. Click Create a new policy. 3. Step 1: Who — From the Available users or groups list, select the users, groups, or both. to whom the policy will apply. For information about users and groups, see About User Authentication . 4. Step 2: What — From the Available categories or category groups list, select what is to be filtered. For information about categories, see Working with Category Group Objects . 5. Step 3: Where — From the Available locations list, select where the policy will apply. For more information about locations, see Working with Location Objects . 6. Step 4: When — From the Available time slots list, select when the policy will apply. For more information about time slots, see Working with Time Slot Objects. • Limit bandwidth to — Enter the number of kilobytes per second to which bandwidth is limited when this policy is applied. • Shared between clients — Select this option to share the bandwidth specified between all clients on the network. If this option is not selected then the limit specified applies to each client, determined by IP, not by user or group. 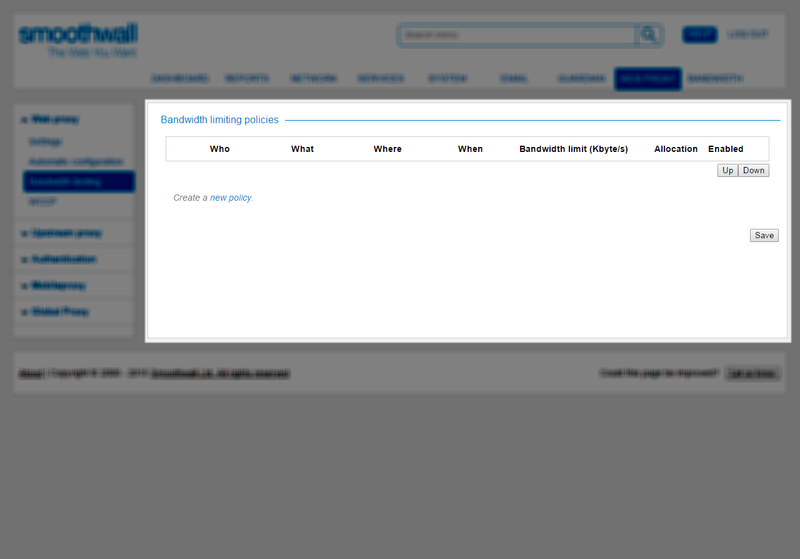 Note: A user or group may be able to draw on bandwidth from several policies. 8. Select Enable policy to enable the policy and then click Confirm. Guardian displays the settings you have selected. 9. Review the settings and click Save to create the policy. Guardian creates the policy and makes it available on the Web proxy > Web proxy > Bandwidth limiting page.